I saw the saint (Mother Teresa) on three occasions. No, not Mother Teresa of Avila, but another giant like her. The encounters if one could call them such were very short and also very powerful. The first occasion was when I was about to start sophomore year in high school in Philadelphia in 1976. The archdiocese celebrated a Eucharistic Congress attended by Mother Teresa of Calcutta (1910-1997). Pope Paul VI was ill and unable to attend but he addressed the congregation via satellite. A papal legate represented him, and Card. Wojytla, later Pope John Paul II, also attended with other Polish bishops as well as Archbishop Fulton Sheen. My sister, who volunteered at the diocesan youth department, helped to organize the meeting with youth. We had a Youth Mass at the Spectrum Sports Arena, and for some reason Mother Teresa washed the feet of a few youth – I was one of them. I don’t remember much, but I know now that a saint touched my feet. Here is the link to an excellent piece on that memorable Eucharistic Congress. Earlier in the week Mother Teresa spoke of Jesus, the Bread of Life, and of the St. Francis Prayer Lord, make me an instrument of your peace. Years later, as a college student, wandering through the streets of Rome, I turned a corner of a narrow street and was almost run over by a group of thirty or so people, and trailing them was a small nun. She passed very close to me, and she was looking with kind and penetrating eyes, as she did. We did not speak, but the chance encounter was another memorable moment in my life. The third time I saw Mother Teresa was, shortly afterwards, at the Basilica of Santa Sabina (named after a noble woman and convert martyred in the year 125) on the Aventine Hill. The church was filled to the brim, mostly with youth, and the little nun came up the podium. For thirty or so minutes she spoke slowly and deliberately about Christian love – about love for those around us and for the poor, and how God provides when we give to those in need. She lived a holy life and she is now a saint in heaven. Pope Francis will canonize her on Sunday, September 4, 2016. We too are called to live holy lives, weak and sinful as we are but trusting in God and striving to love more each day. Jesus wishes to shine in us and through us. the evident fullness of the love my heart bears for you. Amen. A beautiful prayer! Thank you, Father Juan! And what thrilling encounters with this wonderful saint. It struck me that, when she spoke publically, as you wrote, she spoke slowly and deliberately. She let God shine through, rather than using a lot of words or razzle-dazzle. A great lesson. 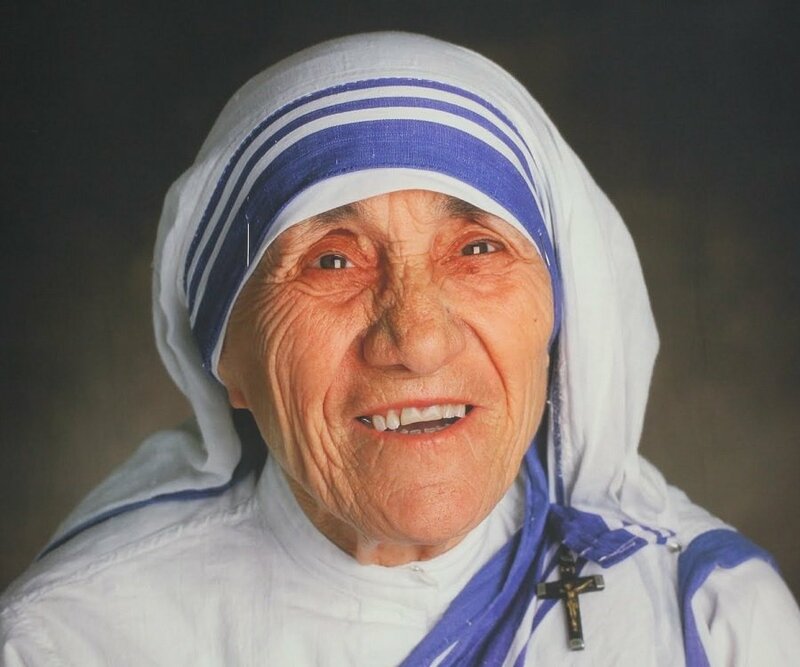 What a unique experience you had with the newly declared Saint Teresa of Calcutta! A vocation to dedicate your life to the Lord and spread His message came indeed out of that encounter. You have a special Saint in Heaven interceding for you! I was familiar with the beautiful prayer to Jesus written by Blessed J.H. Newman, but your adapted version makes it easier to read and memorize. Thanks be to God! Yes, what a beautiful prayer, but I was not the one to make the adaptation. Thank you for this beautiful piece on St. Teresa of Calcutta. Having your feet washed by her…pure Providence! The prayer truly captures her mission and being…if we all could try to shine just a spec of His radiance…the world would be such a different place. Prayers for more heaven on earth! Que maravillosas experiencias sus encuentros con Santa Teresa de Calcuta, Padre Juan! No hay duda de que han sido bendiciones especiales de Nuestro Senor para usted.